Branching off from the Soo Line North Trail near Swatara, the forested Moose River Connector travels seven miles to Land O'Lakes State Forest. The trail connects with the Moose River Trail for an additional 29 miles of riding as well as access to the White Oak Lake Campground. 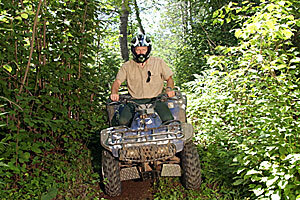 The trail is provided by Aitkin County and local ATV Clubs. Parking is available in Swatara and Remer.